On your first visit, you may find this group to be friendly and easygoing, which we are, but we are also highly trained and hold vast experience and education in the health care field. It is our philosophies that our clients are treated like family, with both the professionalism as well as dedication you should expect from experts like us. 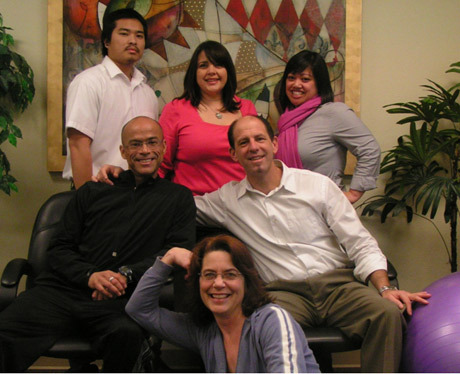 Our chiropractic physicians are both highly trained and skilled as practitioners. For example, Dr. Rick Junnila was the Director of Manual and Physical Medicine for Sutter Occupational Health for over 7 years. Additionally he has advanced education in MRI, spinal biomechanical engineering, sports medicine, whiplash, nutrition, radiology, chronic pain and manipulation under anesthesia. Dr. Brenda Ramos has degrees in molecular biology and biochemistry from UC Davis. She worked as a scientist for Genetic and has recently changed her career path to become a chiropractic doctor. Our massage therapists have more than 18 years experience with treatment of conditions such as sports injuries, severe muscle spasms, sciatica, headaches, carpal tunnel, jaw problems (I could continue)… as well as being trained in the most luxurious spas in the area. They are trained in many types of massage and will always tailor your treatment to your condition and preferences. You should feel at ease knowing these professionals are here to help. Specializes in pain treatment, and experienced in the care of stress related complaints, allergies, women’s health and fertility. Currently on Faculty, American College of Traditional Chinese Medicine, San Francisco. Former associate professor in Guang Zhou University of Traditional Chinese Medicine, China. Guest lecturer in Middlesex University (London), Acupuncture Foundation (Ireland) and Italian School of Traditional Chinese Medicine (Bologna). We work with athletes of every level, from the professional to the weekend warrior. Injuries are common in sports and we have advanced methods to help you along the road to a speedy recovery. The sooner the treatment starts, the sooner we can get you back in the game.